The Friends of Quarry Road are developing a new master plan that will articulate a unified, multi-season vision for the future of Quarry Road Trails. 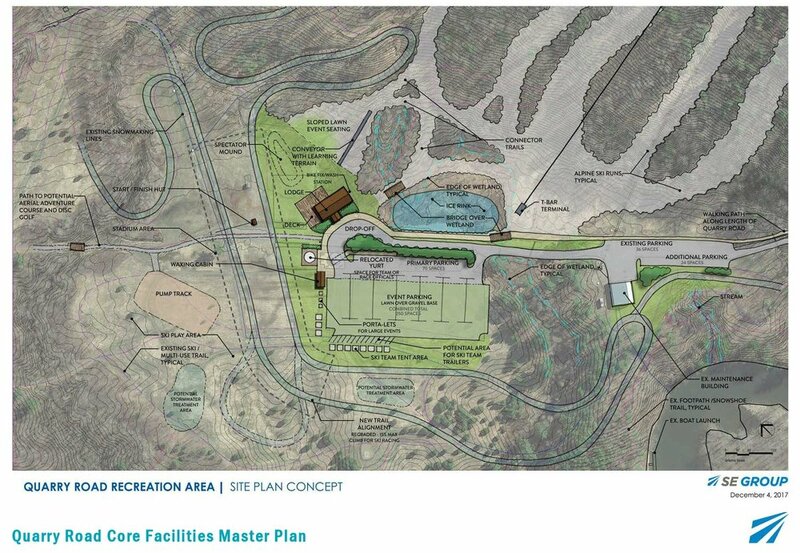 The master plan will explore opportunities to increase usage in all seasons, grow the Nordic ski operations, re-establish the Alpine skiing operation, and construct physical infrastructure that would enable the area to host large events. In working towards these goals, the master planning process includes a substantial effort to engage the Waterville and Quarry Road Trails community. This includes a public workshop and open house, an online survey, a series of interviews and ongoing coordination with key stakeholder groups, and a public presentation of the draft master plan concept. All of these inputs, and the resultant plans and analyses, will be distributed to the broader public via this website. Your participation and continued interest in the project are vital to its success. Stay current on project activities by visiting this website, following Quarry Road Trails on Facebook, or signing up to receive updates by email. The project kicked off in mid-summer 2017 and will run through winter 2018. 7/12/17: Our first public meeting was held on Wednesday, July 12, along with a full day of small-group stakeholder meetings. Thank you to everyone who showed up to share your ideas and enthusiasm. An online survey allowed those not able to attend the meeting to make their voices heard as well. 12/4/17: The second public meeting was held at the Waterville Opera House on Monday, December 4. We shared results of the first meeting and online survey, and draft conceptual plans for the core area and potential revival of the downhill ski area. Winter 2018: Reviewing and summarizing public input from the second public meeting, preparing a final concept plan, preparing order-of-magnitude cost estimates (for parking & lodge, alpine capital, and alpine operation), and developing a phasing plan and recommendations for moving the process forward. Ongoing: Friends of Quarry Road continues to flesh out the details of how programming, events, and facilities will all interplay and to develop a funding plan. Help us plan for four seasons of fun in Waterville! For questions, or to share your thoughts on the plan and the future of Quarry Road Trails, please contact Friends of Quarry Road Facilities Planning Chair Joseph Reisert at joseph.reisert@colby.edu.